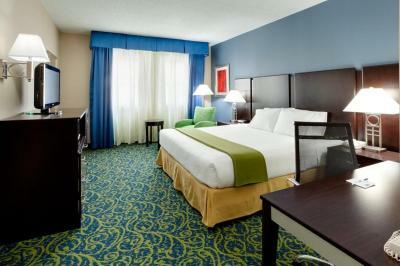 Lock in a great price for Holiday Inn Express Owego – rated 8.6 by recent guests! The room was clean. The staff was very friendly and helpful. Breakfast was good (I prefer waffles to pancakes though!) Checkout time of noon was also great- no rushing to get out in time. It was nice to be able to get breakfast right there, not to have to hurry. Some days better than others. It was a comfortable sleeping. The staff was very friendly and helpful with restaurant recommendations and things to do nearby. Room was bigger than I'd anticipated and had a full kitchen. Breakfast was also really nice with more than just the normal continental breakfast fare and good coffee. Lot better than other Lodging nearby. Fine for our intended purpose. The location was great, right off the highway and right on the river. Even had a small porch in the breakfast area where you could sit outside. Rooms were nicely furnished and clean. Holiday Inn Express Owego This rating is a reflection of how the property compares to the industry standard when it comes to price, facilities and services available. It's based on a self-evaluation by the property. Use this rating to help choose your stay! Located in Owego, Holiday Inn Express Owego offers 3-star accommodations with a fitness center, a garden and a shared lounge. With free WiFi, this 3-star hotel offers a 24-hour front desk. The property is 3.8 miles from Apalachin Marsh Bird Sanctuary. All guest rooms comes with air conditioning, a microwave, a fridge, a coffee machine, a bath, free toiletries and a desk. Complete with a private bathroom, guest rooms at the hotel come with a flat-screen TV, and some rooms contain a seating area. The rooms have a closet. Hiawatha Island Wildlife Refuge is 11 miles from Holiday Inn Express Owego. Greater Binghamton (Edwin A. Link Field) Airport is 24 miles from the property. This property is also rated for the best value in Owego! Guests are getting more for their money when compared to other properties in this city. When would you like to stay at Holiday Inn Express Owego? House Rules Holiday Inn Express Owego takes special requests – add in the next step! Holiday Inn Express Owego accepts these cards and reserves the right to temporarily hold an amount prior to arrival. Bathroom crowded and outdated..and off the bedroom space which was weird! Keurig in room did not work. Did not heat and stopped before the brewing started. Bathroom was really tight. Stayed 2 days and three nights. Second day did not get housekeeping service, and they said it was because I hung a “green” tag on my door. Uh, what green tag. Manager believed the housekeeper and said it was my fault. So, they lied and called me the liar. Stay at Hampton Inn next door. The shower head had some build up so the pressure was a little wonky. Very comfortable bed. Loved the pillows. Toilet paper. Lighting wasn't enough to comfortable to read by. Wasn't able to get much on tv, would liked to have local channels, so we could watch our regular programs. Need better channel guide. That would really be nice. The bathrooms are tiny, even for 1 or two people! The bananas at breakfast were perfect, if you wanted to make banana bread, not so good for eating! Bathroom was awkward and shower/toilet combo was very small. Bed and pillows were too soft. Door to the room was heavy with a stiff hinge, hard to open and close. Friendly staff. Convenient location. cleanliness. I booked 2 double beds and all that was left was a king. One of my coaches had to sleep on the ground.